With his rooted conviction in the opportunities provided by painting, Alessandro Pessoli (Cervia, 1963) has revisited, theoretically and formally, the means of painting for over thirty years. His rich visual vocabulary includes classically-inspired iconography alternated with references to futurist expressivity, as well as with incursions into the realms of science fiction and cartoons. Such a wealth of imagery finds correspondence in an equally rich plurality of materials and techniques: from ink on paper drawings to animated film. It is precisely the relationship between these two latter extremes that generated “The Neighbors” exhibition, Pessoli’s first solo show in an Italian museum, curated by Nicola Ricciardi. The exhibition is to be seen in the context of the MAN Museum’s focus in recent years on the relationship between visual arts and animated film; indeed the show originates from the study of two stop-motion films that Pessoli created almost fifteen years apart. In Caligola (1999-2002), human beings, animals, and inanimate objects appear and disappear in constant oscillation between construction and destruction. The over , drawings composing the film do not weave a single plot but, rather, follow an irrational structure and the symbolic wealth of a feverish dream, alternating playful moments with grotesque representations and borrowing from such distant iconographies as a crucified Christ and a World War I plane in the sky. 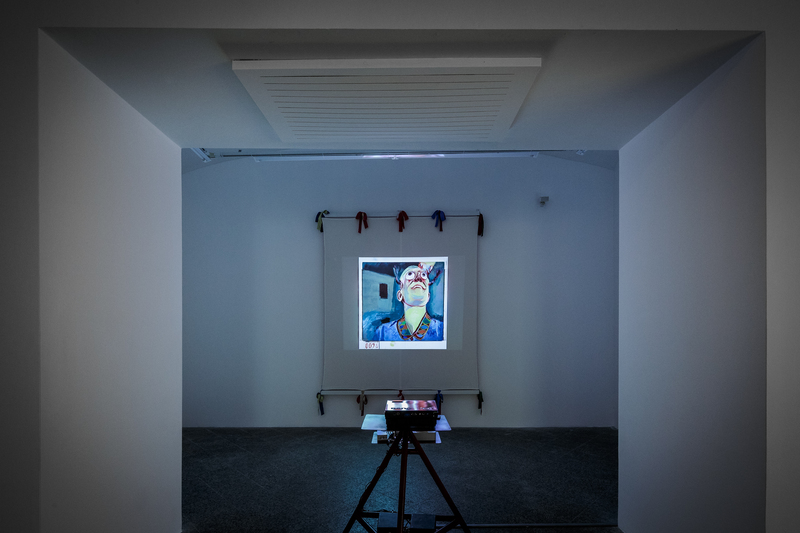 By contrast Autoritratto Petrolini (Petrolini Self-Portrait, 2014) rotates around the figure of the Italian actor and playwright Ettore Petrolini and the rather Dadaist character he invented named Fortunello. In Pessoli’s hands the latter becomes the expedient through which issues tied to Italy’s cultural history can be explored, and reflections on the artist’s identity and true nature can be presented. The apparent distance between these two products of animation is abbreviated by the various series of drawings displayed in the show; among them The Neighbors, made specifically for this occasion. 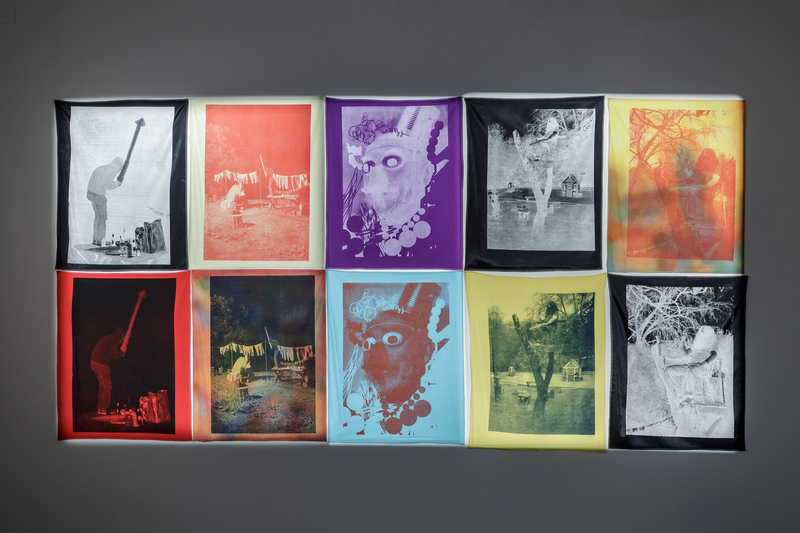 Executed in separate moments between the year 2000 and recent times, the ink on paper drawings as well as the silk-screened canvases share a setting and a taste that is covertly cinematographic. Here Captain America and Pop-Eye; religious icons and popular culture; as well as personal experiences are interwoven with Italian national history, while allusions to the Renaissance dialogue with references to European Pop Art painting – all elements that appear repeatedly. These polyhedric works, taken as a set, communicate the special agility of Pessoli’s thought, an aptitude that has allowed him over the years to move between diverse themes and vocabularies without ever losing sight of his own determined formal investigation. 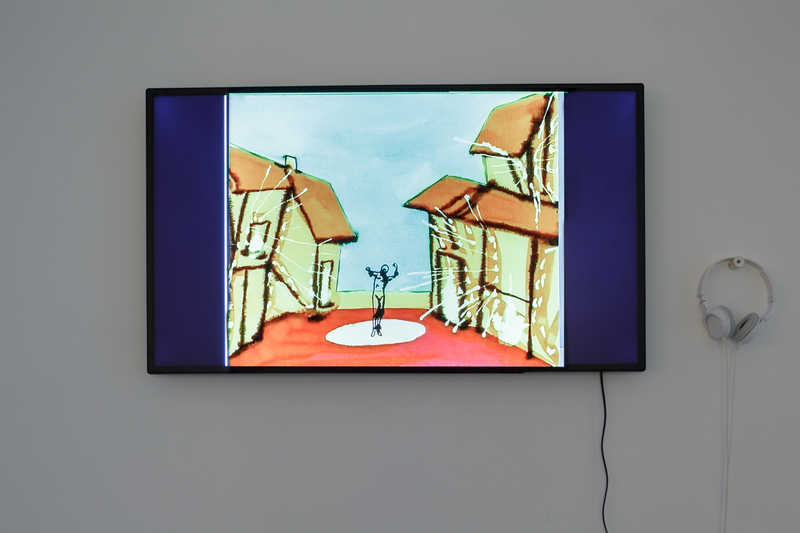 The exhibition closes spatially and chronologically with the self-portrait Studio City (2015), in which the artist appears as the protagonist of a very colourful cartoon. The title is an explicit reference to Los Angeles, the city where Pessoli has been living since 2009, and particularly to the neighborhood where the main movie studios are housed. This is the ideal backdrop for the exciting adventures of his characters who can be walk-ons waiting for roles on a film set, as well as people from the area, familiar faces or from next door, neighbors.